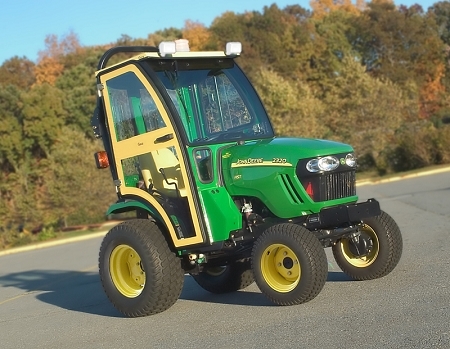 Soft side cab fits 2025R, 2032R, 2320, 2520 & 2720 John Deere compact utility tractors. The safety light and work lights are not standard equipment on the cab. They are available for purchase separately. Hard canopy top with acoustical headliner. 12 volt heavy duty electric wiper. Automotive style safety glass front windshield. Pin-hinged doors for easy removal in seconds. 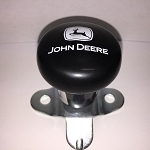 Soft Doors are "Jeep Style", metal framed with handles, latches and hinges. Due to the size or required packaging of this item, it must ship truck freight. This truck freight items ship for free to your door in the contiguous United States. Please allow 10-15 business days for delivery on ALL truck freight items. Tracking updates are not available on this item. Very pleased with this product. Be prepared to spend a couple of days putting it together. $1,500 cheaper than here in Canada even with the 200 shipping and 100 brokerage fee. Shipped fast. Excellent packaging. Only issue was directions. Universal for other models and aren't always clear. The cab is of excellent quality and very well built. It was very well packed for shipment. I did find that the direction were a little difficult to follow as they were for 2 different tractors. I had to call customer service at Curtis and they answered the question with no problem. I do love my Cab.